Help us write Reunions magazine! 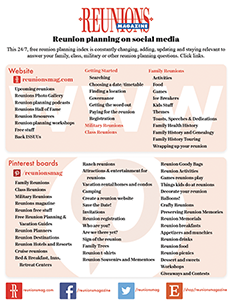 As an incentive for your time to answer these questions, we will give you a one-year subscription to Reunions magazine. Be sure to include your name and address so we’ll know where to send it. If you’re planning your first reunion, say so and complete answers with what you are hoping to do. The distinction of Reunions magazine is that our content is reader-driven. That means our readers share their own reunion stories/reports and fill them with lessons, answers, suggestions, ideas, cautions and always the joy of reunion. 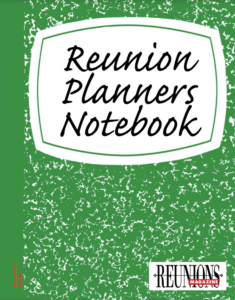 We realize not every reunion is lucky enough to have someone willing to submit a report, so we devised these questions whose answers give us some really good ideas about your reunion. Some answers can be woven into reports, others are cited in feature material in the magazine. For example, you report interesting kids activities and we might use that in a feature about planning for kids at reunions. Or if you play special games at your reunion, you could expect to see that cited in reunion games. If you have a report to submit for consideration, email it to editor@reunionsmag.com. Pictures MUST be 300 dpi or higher. Think of this as your contribution to others who are planning their reunions. 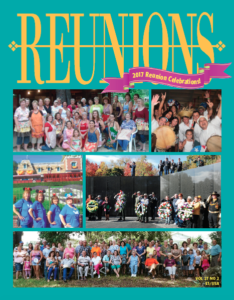 Then, peruse reunion planning material in Reunions magazine and on reunionsmag.com for ideas from others to you. Share the joy!